There was a childrens festival at the Southstreet Seport in downtown Manhattan today and somehow I got roped into going. The original plan was just for the Mysterious Chinese Woman and me to meet her sister for dinner before she went to a play. Somewhere along the way another sister of hers decided to bring her daughter to the festival and then meet her husband later. Everyone seemed to think it would be great fun if I joined them. Luckily I had the forsight to suggest that we meet at the Heartland Brewery that is almost in the Seaport. Also luckily, for me at least, the sister-in-law's had a hard time finding a parking place so I was able to settle in for a few beers before they showed up. Although I always take exception that Heartland still advertises themselves as a brew pub, long after they have stopped making their beer on the premises and now make it in a brewery in Brooklyn and truck it in to their multiple locations, their beer is still quite good. 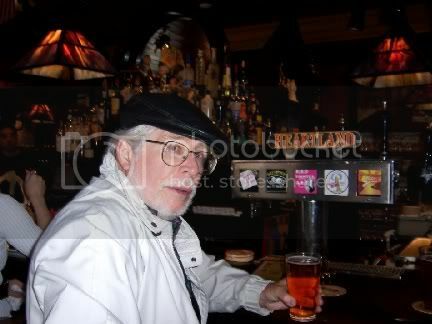 I started out with an Empire Premium Lager and the Mysterious Chinese Woman had a Summertime Apricot Ale. The Empire was very good, like a good Czech lager. Quite crisp, a bit on the dry side, with a nice bit of hops but not overdone. This, to me, is what a lager should taste like. You will notice that I think Asahi gets it right as well. The Apricot Ale had a bit of an apricot nose to it but not much of an apricot flavor, at least not that I could discern. It did, however, have a nutty back taste to it. Tasted like hazelnut to me. Not bad, but I was looking forward to a bit more apricot, more like Magic Hat #9. The sister-in-laws showed up with little neice Suzie and decided to head out to enjoy the fair. I begged off saying it was way too crowded out there so after they left I treated myself to a Belgian Cherry Chocolate Stout. 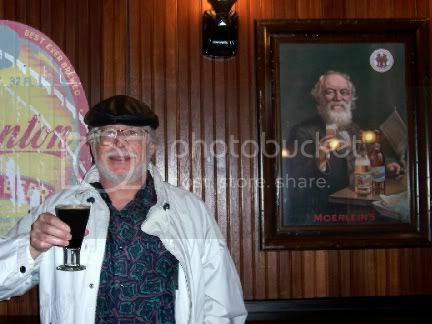 One day I hope to achieve the dignified look of the guy in the picture behind me. The Mysterious Chinese Woman says I just need to stop trimming my hair and beard. Maybe my palate just wasn't attuned to fruit today but the Cherry Chocolate Stout didn't taste at all like cherries to me. And it certainly didn't seem much like a typical Belgian ale, although they claime to use a special Belgian yeast. It is a hefty 8% alcohol though and tastes a bit like a Russian Imperial Stout. Not bad at all but not one you would quaff in large amounts on a summer day. I switched back to the Empire. 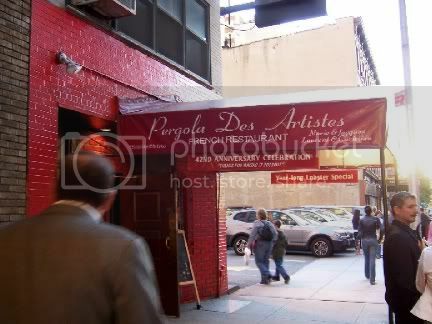 After about an hour or so everyone returned and the three of us who were having dinner headed to the theatre district. We went to a very French Bistro that I had heard a lot about and I was very pleased with my choice. This place is located on 46th Street between 7th and 8th Avenues, As you can tell by the awning, it has been around for 43 years and is still owned and operated by the family that originally started it. The two sons seem to do most of the heavy lifting but their mother, resplendent in a silver sequined baseball cap, was scurrying about and cleaning tables. 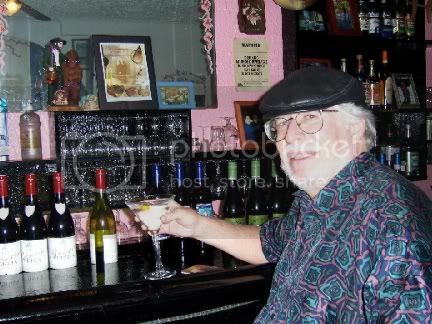 I settled in at the bar and had my usual, a Bombay Martini, up with a twist. Then we tucked into some very good grub. I had a hanger steak with carmelized onions and the MCW and her sister had duck. Everyone thought the food was great and the prices were quite reasonable for this neck of the woods. The service was friendly and the atmosphere was casual. This is a place to which I would definitly return. I finished up with a Sambuca and Espresso and then we headed out, my sister-in-law to the play and me to Brooklyn. The Mysterious Chinese Woman just sort of pouffed into a cloud of orange smoke that smelled vaguely of apricots. 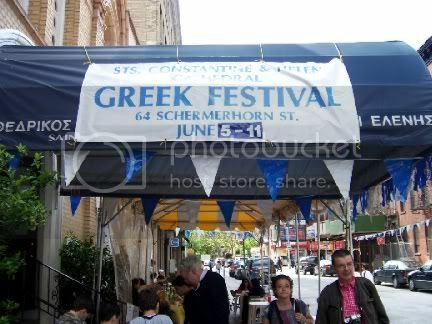 At least once a year (it seems more like once a month) the Greek Orthodox Church down the block from me holds a week-long festival that is always a lot of fun. They block off the street and there is a plenty of Greek food, some of it furnished by local restaurants and some of it brought in by members of the church. They also grill a lot of lamb and chicken for shish-kabobs that they are really great. The lamb, in particular, is always very flavorful and quite delicious. Sometimes they will have a goat on a spit but I didn't see it this time. I can never get any anyway because the church members seem to know just when it is going to be done and gobble it all up before I get there. Not much of a bar here, but you can get cheap beer and wine and the stronger stuff as well. 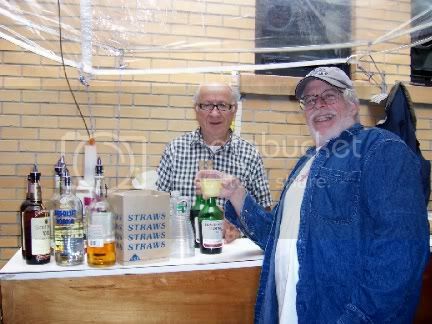 Now that is something you never saw at the sphagetti dinners at North Methodist Church in Minneapolis where I grew up. They even used grape juice for communion. Sometimes you wake up in the morning and just really want a beer for breakfast. When that happens you want a few things; a big beer, a cold beer, and a nice crisp flavored beer. 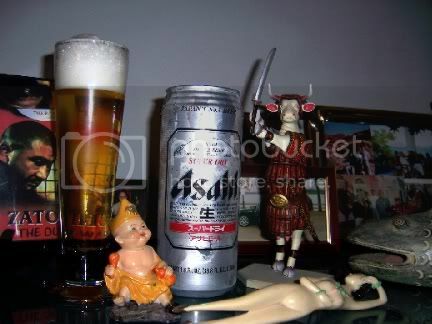 Now Asahi, a Japanese beer, has it all. It is what beers like Budweiser and Coors and all the rest should try for. Hello, you can be a lager and still have flavor. There is a reason that Budweiser has to sell under an alias in Germany where they paid a bundle to advertise themselves in the World Cup. Good Lord, German beers are actually good. How many cups of Budweiser do you think will be sold in the stadium, other than the ones to be dumped on the heads of opposing players. I just wish one of the major breweries in the United States would actually try to add a bit of flavor to their beer. Are they really convinced that the American beer drinking public likes water with a smidgeon of alchohol? My tirade is over. I have also discovered the perfect morning drink. Over a tall glass of ice-cubes; Two shots of gin, two shots of orange juice, top with Club Soda. Gin gives you a nice angry edge to face the day, which you need in New York. I am going to try rum when I want to be a bit more laid back.